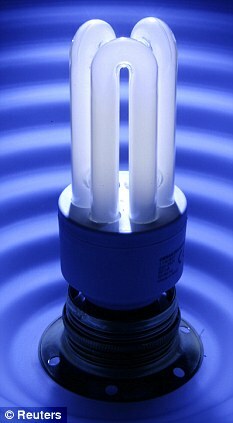 Energy saving bulbs emit cancer causing chemicals it was claimed last night as new fears were raised about their safety. Scientists said they should not be left on for long periods of time or placed close to a person’s head because they release poisonous materials. The EU has unveiled plans to phase out ‘normal’ incandescent bulbs by the end of next year as they try to cut carbon emissions. They should not be used by adults to read or kept near a child’s head all night, the experts said. While it is already known that harmful amounts of Mercury are released if one of the new ‘green’ bulbs is broken, the latest research shows other carcinogenic chemicals are emitted when they are switched on. The German research shows that the chemicals are released as a form of steam. The harmful substances include phenol – a poison injected by the Nazis to kill thousands of concentration camp victims during World War II – and the human toxins naphthalene and styrene. Tests showed that the materials used to make the lamps are probably responsible for their potentially harmful side effects. The Department for the Environment has insisted that the bulbs are safe. LIGHT BULBS 02 CFLs & MERCURY! Next Next post: #G0465* – BRITAIN BETRAYED – by Its Incompetent Politicians AGAIN! Yes, and as your previous posts also show, the cancer issue is not the only problem with CFLs, or even LEDs…Home Safety: Fire Risks — Radiation — HealthThe CFL Mercury Issue: Breakage — Recycling — Dumping — Mining — Manufacturing — Transport — Power PlantsLEDs: The Lead and Arsenic IssueLead, arsenic and other toxic content, home breakage and disposal concernsThe Overall Small Energy SavingsUSA Dept of Energy and EU official sources, less than 1% of society energy usage saved from light bulb regulations..as covered on ceolas.net/#li18eaxNotice also how major light bulb manufacturers welcome the ban on unprofitable cheap simple types of incandescent light bulbs,allowing them to sell more CFLs, that people would not otherwise buy – and, arguably, justifiably would not buy…..